Focusing on gratitude this month has been such a blessing. For an entire month, I have thought about gratitude, looked for it, written about it, discussed it, read about it, investigated it, explored it, and found it over and over. As I have been living and breathing gratitude these last weeks, an amazing thing has happened. I have fallen in love with my life. Sometimes I will just be going through my day, doing nothing special, and all of a sudden this feeling of almost giddy pleasure washes over me. I think, and sometimes even say out loud, “I love my life!” Sometimes I just shake my head in disbelief at the overwhelming abundance of blessings I have been graced with. My heart swells with such humbling gratitude that I think it might burst wide open like a pinata, and flowers and butterflies will pour forth until the world is covered in them. Anne Lamott says that the two best prayers are “Help me, help me, help me,” and “Thank you, thank you, thank you.” I wonder if we would need the first prayer so much if we started with the second prayer and prayed it more often. Just a thought. As some of you know, I lead a monthly discussion group on the 10 Steps. We have been focusing on one Step a month, as I have been on the blog. After our discussion earlier this month on gratitude, I received an email from someone in the group. I am quoting part of it here, with her permission. Thursday I went downtown to have lunch with my daughter, and to take a package of hers home from her office in my car since she travels by bicycle. It was so crazy on the streets with construction etc., that I parked in a garage and we stopped by my car to drop off her package on our way to the food carts. In the parking garage I tripped on a curb and fell face first. I have a broken foot, in a cast, and an abraded face that scabbed up impressively after all the bleeding stopped. The punch line is, the first thing I said was (after "ow!") "I am so grateful that all of my teeth are intact, and that my glasses weren't damaged!" It was a reflexive statement rather than considered, and then it took a couple days before I realized that I had been practicing the very thing we discussed in our group this month! Some staff at urgent care commented on my positive perspective, which was nice, but the real payoff has been that even though this is painful and very inconvenient, it has not stolen my happiness. 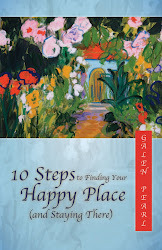 So three cheers for our 10 steps to happiness and how to keep it!... This is my testimonial to show that #9 really does work in the face of adversity. I was so pleased to hear that she was keeping her spirits up in spite of a painful and debilitating accident, and for me, it confirmed my own experience this month of having gratitude permeate my perspective on life. So I would like to end this month with an exercise we did in our discussion group. We came up with a list of ways to remind ourselves to be grateful. Here are some of the ideas. 1. For one minute list things you are grateful for. 2. Set your screen on your phone or computer to show a gratitude reminder. 3. Set your phone to vibrate at set times as a reminder to be grateful. 4. Keep a picture of your kids (dog, boat, significant other, whatever works) where you can see it. 5. Use post it note reminders. 6. Meet regularly with a friend or a group to focus on gratitude. 7. Keep a running gratitude list that you add to every morning or every evening. 8. Notice things to be grateful for as you go through your day. 9. Share your gratitude with someone – tell someone what you are grateful for. 10. Say thank you to clerks, cashiers, servers, all the people who help you during your day. 11. Be generous with compliments. 12. Express gratitude and appreciation to children for their kind acts. 13. Say please and thank you. 14. Mention good service to a supervisor. 15. Recognize that it’s never too late to say thank you to someone, perhaps with an apology if appropriate. 16. Use a gratitude reminder as a password. 17. Give thanks before meals and before bedtime. 18. Look for ways to bring gratitude into conversation with others. 19. Keep a gratitude journal. Would any of these be helpful to you? Do you have other ideas to add to the list? This month would not be complete if I did not take this opportunity to say a huge thank you to all of you. I do so enjoy our interaction through reading each other’s blogs and comments. We might connect only through cyberspace, but the connection is real and meaningful to me. You enrich my life and I am grateful. One of my favorite bloggers is Sandra Pawula at Always Well Within. She very generously and graciously nominated me to participate in the My 7 Links blog post project, created by the Tripbase travel blog. Tripbase shares the best posts from participating bloggers on their blog and every day on Facebook and Twitter at #My7Links. We are asked to choose one post in each of seven categories to link back to. I have to say that this was an interesting task because I myself have forgotten much of what I’ve written. And even though I’m not sure any of it warrants seeing the light of day again, I enjoyed going back and remembering, like going through old photo albums. Anyway, here are my 7 links. Most helpful – Fun is Good! Part of the pleasure of receiving this nomination is that I can then nominate five more bloggers to participate. I call it a pleasure but it is also a challenge, because there are certainly more than five I would like to nominate. So I tried to choose a variety of blogs. I hope you will visit them, as well as Sandra’s blog. I have been reflecting on James’s words this month as we focus on Step 9–Develop an attitude of gratitude. One might not expect profound wisdom from the mouth of a young adult with autism, which just proves that we need to be open to truth from any source. Notice that James didn’t just say he has everything he needs. He went further to say that he has everything he wants. How many of us can say that? How many of us do say it? The painting reminds me every morning that today is a new day. A fresh start. A new beginning. A day of possibilities. What will I do with them? A few days ago, I read a wonderful interview involving two of my favorite bloggers. Tess at The Bold Life interviewed Sibyl Chavis, who writes The Possibility of Today. In the interview, Sibyl quoted this wonderful suggestion from the Dalai Lama. Every day, think as you wake up, Today I am fortunate to be alive. I have a precious human life. I am not going to waste it. I am going to use all my energies to develop myself, to expand my heart out to others, to achieve enlightenment for the benefit of all beings. I am going to have kind thoughts towards others. I am not going to get angry or think badly about others. I am going to benefit others as much as I can. The first part focuses on gratitude. A simple thank you for our lives, an appreciation of the gift we have been given. The second part focuses on aspirations for the day. You could make whatever aspirations you want. Pema Chodron describes this aspiration practice as “one at the beginning, and one at the end.” In the morning, she makes an aspiration for the day. For example, “May I not speak or act out of anger.” Keep it simple. Then, in the evening, she reviews the day. If you are like me, then you might not have a perfect aspiration track record for the day. Chodron anticipates that (must be common!) by encouraging us to rejoice if we remember our aspiration even once during the day. And if we forgot it completely, then we can rejoice that we have the capacity to be aware of that! Thich Nhat Hanh describes the Buddhist practice of “beginning anew.” Beginning anew is a determination not to repeat the mistakes of the past, a commitment to living in mindfulness. It reminds me of the Christian concept of reconciliation, or the Jewish concept of atonement. Honestly acknowledging our past frees us to begin anew. Each time we make this vow to ourselves, transformation occurs immediately. We can renew this intention as often as we feel the need to unburden our hearts and start fresh. I like the theme of rejoicing in our effort rather than scolding ourselves for our imperfection. What a pleasant way to begin and end the day, with gratitude. And to anticipate tomorrow. Full of promise. Newly bright. I'm a Grandmother...and I'm Grateful! 434. My grandson was born a few days ago. 435. My daughter was a champion. 436. We made it to the hospital in time. 437. He wasn’t born on the living room floor. 438. Her boyfriend was an awesome coach. 439. He took it in stride when she temporarily threw him out of the delivery room. 440. She was glad when he came back. 441. I got to see the birth. 443. My daughter is a better new mom at 19 than I was at 35. 444. Her boyfriend is the best new dad I have ever seen. 445. They have magically transformed in the past months from irresponsible teenagers to mature, compassionate, informed, and loving parents. 446. Being a grandmother is lots of fun. I was pleased to be asked by Corinne at Everyday Gyaan to write a guest post on this topic. Although I possess no special qualifications to answer such a question, I humbly offer a few thoughts. I spent some time looking up dictionary definitions. My favorite one was simply “freedom from ignorance.” When Buddha was asked if he was a god or an angel, he answered no. The questioner persisted, “Then what are you?” Buddha replied, “I am awake.” When we are awake in this sense, we are free from ignorance. I just called my accountant and said thanks. If you pay estimated tax in the US, today is tax day. My accountant sends me the all-filled-out form I need to submit, detailed instructions on what to write on the check, and an already addressed envelope. All I need to do is write the check, put it in the envelope with the form, and put a stamp on it. As I was going through this process this morning, I realized how easy it was because of all the hours he put into knowing the rules, computing my taxes, and sending me such clear instructions. So I called him and said thanks. He said he didn’t get many calls like that and he appreciated it. Is there someone who makes your life easier on a regular basis? Or maybe someone who did something nice for you a long time ago? Or someone who might do something nice for you today? I could list so many more, and I’m sure you can, too. We can’t thank everyone in one day, but what if we said thank you to at least one person every day? Grab a pen and paper and a timer. Okay, for one minute list all the things you are grateful for. Ready, set, go! Stop! How many did you list? If you can think of that many things in one minute, how many other things could you list in a longer period? More importantly, how did you feel for that one minute when you were making your list? Were you angry? Whiny? Probably not. Maybe you were even smiling. Gratitude will soften anger, counter complaining, comfort sadness, and lift our spirits. Now that the minute is over and you are looking at your list, how do you feel? Still grateful? That’s the gratitude afterglow. This is an easy technique to use anywhere and anytime. I used it most recently when I was stuck in a situation I was eager to get out of. I was starting to get fidgety and grumpy. I looked at the clock and for one minute I mentally listed things I was grateful for. At the end of the minute, I had relaxed, and if I was still not enthusiastic, I was at least pleasantly and comfortably resigned to being patient with a good attitude! One minute is a small investment in what could be a major shift in your perspective. Give it a try and let me know if it works for you. Ten years ago, the French newspaper Le Monde declared “Nous sommes tous americains.” We are all Americans. In the decade since 9/11, we have seen the world community come together in the wake of disaster and crisis. The tsunami in Southeast Asia, the miners in Chile, the earthquakes in Haiti and Japan. Ionesco was right about anguish. And yet still, and perhaps even more so, in the absence of catastrophe, we remain divided by fear. A Newsweek article asks, “Did Osama win?” If the goal of 9/11 was to provoke an civilizational war, then watch the news and draw your own conclusion. Ionesco was right about ideologies. My prayer for the coming decade is that Ionesco was right about dreams. For most of my adult life, this is not a conversation I could have had. There was always some aspect of my life in upheaval, in crisis, in dramatic transition. Not all of it was bad. Some of the transitions were sought after. But much of it was hard. Kids with special needs, relationships ending badly, foster kids in crisis, moving often, loved ones dying, injuries and illness. Much of what was hard was hard because I made hard things harder, by trying to control events and people, by trying to make things other than what they were, by never asking for or accepting help, by magical thinking and massive denial, by debilitating guilt and shame. I used to wish for an ordinary day. A day like any other, when nothing major happened, when there was no crisis to handle. A day that was unremarkable, with no surprises, a day easy to forget. I have days like that now. That’s partly because my life has settled down a lot in recent years. And it’s partly because I have learned to roll along with life a bit more smoothly than before. If you are having an ordinary day today, then consider yourself blessed. And please send some good thoughts to those who are struggling today. What’s up? Not much. Thank God. My favorite bagger at the grocery store is David. David is a man with some sort of developmental disability, although he functions with a high degree of independence. He is unfailingly friendly and we always chat while he is bagging the groceries. We often talk football, and he especially enjoys teasing me about my team, which is currently, well, underperforming, while his, of course, is not. My two adult sons, James and Dan, have autism. They are not able to live independently. They are both verbal but have limited communication skills and pretty much no social sensitivity. Neither of them would be able to hold down David’s job. I was in the store not long ago with James and Dan. While we were at the checkout stand, Dan picked up on something different about David. In his usual direct way, Dan asked him, “Are you disability?” Meaning, of course, are you disabled? I suppressed a gasp and glanced at Tina, the cashier. David, looking like a deer in the headlights, stammered, “What?” Dan, bless his heart (you gotta love him), didn’t miss a beat and asked him again. Well, there you go, I thought. Aren’t we all like that? I chuckled and patted Dan on the knee and home we went. When I got home from the cabin yesterday, I was so overwhelmed and excited by all the comments waiting for me. I was excited because, well, people commented. That’s always nice. And I was overwhelmed by the pouring forth of gratitude expressed in the comments. I found that as I was reading them, my own heart filled up with gratitude. That made me pause. I wasn’t really focused on my own gratitude when I started reading the comments, but reading them triggered gratitude in my own spirit. By the time I finished reading them, I was filled to overflowing with humble gratitude for my life and all its blessings. We’re onto something here, I think. It seems that by sharing our gratitude we spark gratitude in others. That might seem obvious to you, but I had not made that connection until I experienced it when reading your comments. Expressing our gratitude not only increases our own happiness, but it will awaken gratitude in others and thereby increase their happiness as well. Wow. One way to express our gratitude is to say thank you. When people comment I do try to respond and thank everyone individually in my response. But I can’t remember the last time I said thank you to all y’all for reading my blog. Not everyone comments or emails, but every reader is appreciated and welcome. We are all busy and there are many wonderful ways we can spend our time. That you would take some of your valuable time to spend reading my blog is a gift to me. I am humbly pleased and honored and grateful. And thank you for the value you bring to my life with your own blogs. I don’t always comment, but I gain so much from you. You inspire me, challenge me, entertain me, and teach me. Studies show that grateful people are happier and healthier. So let’s see if we can end this month even more grateful than we are now. One quick and easy way to develop an attitude of gratitude is to count your blessings. There are many ways to do this, and they’re all good. One idea I’ve read about on several blogs is to start a gratitude list and add to it until you have listed 1000 gifts. You can do this any way you like, but as you might guess, the more regular your practice, the greater the benefit. I started my list awhile back. Here are the things I just added to my list. Do you have a list already? If not, would you like to start one? One caution. If you start a list, then have fun with it. Don’t make it one more thing you have to do on your already too long to do list. I am not very regular in adding to mine, but every time I visit it to add more, I’m reminded that no matter how many blessings are on my list, there are countless more to add! Have a wonderful weekend (a holiday weekend here in the US). Let’s start this month of focusing on Step 9 (Develop an attitude of gratitude) by being grateful that we are no longer focusing on forgiveness. Goodness, last month was a challenge! Here is a much easier and more fun challenge, the Gratitude Challenge. When you are feeling negative about something, say you are grateful for it. It’s okay if you don’t mean it. Just say it. I have discovered that AA is really onto something with their “fake it till you make it” approach. If it is true that we feel the way we act, then act the way you want to feel. So say to yourself, “I’m grateful for [whatever is causing you consternation].” Then you just keep going until some small rays of real gratitude break through the dark clouds. I’ll give you two examples from previous posts. The crazy thing is that somewhere between I’m grateful for the traffic and I’m grateful I have a job, I started to feel truly grateful. By the time I got past the traffic jam and was zipping along the highway to work, I was glowing with gratitude, feeling blessed beyond belief. And I was grateful for that. The second example occurred last winter when I was sick with the flu. See how it works? Are you willing to give it a try? Have some fun with gratitude. And remember, fun is good!